Tracey Snellings artistic vision is fueled by images of urban streets, most notably as they appear in American genre films of the 1940s and 50s. Her multimedia sculptures channel the romance of low rent noirs, tales set in worn out motels and on rain-slicked streets or dry western settings where someones on the lam. The narratives may be 20th century, but they emerge from an older spirit of the frontier and manifest destiny, in which the quest to move forward is embodied by lone wolves and outcasts. They are characters who forge their own realities in landscapes just outside a sheriffs jurisdiction. These places may evolve over time, but even Snellings updated urban settings happily maintain an outsider dignity. Hers are fictional sites inspired by actual ones. Movies, after all, are filmed in real places, on constructed sets or in spiffed-up, art-directed real life locations. It seems to rain a whole lot more in film noir Los Angeles than the authentically arid City of Angels, yet theres something so truthful about the psychological atmosphere of those wet streets. In this sense, Snellings art is emphatically about place, however invented it may be. With the support of the Galerie Urs Meile Cao Changdi residency, Snelling has been able to live in and respond directly to contemporary Chinese culture, and to sites and conditions rooted less in media than in the artists own experience of them. Unlike her previous work, this series, Where Mr. Wong Sent Me, was made in close proximity to the subjects depicted, and to where the work makes its premiere gallery appearance. This provides an opportunity for Snelling to expand her practice and engage more explicitly documentary elements, such as video and photography. 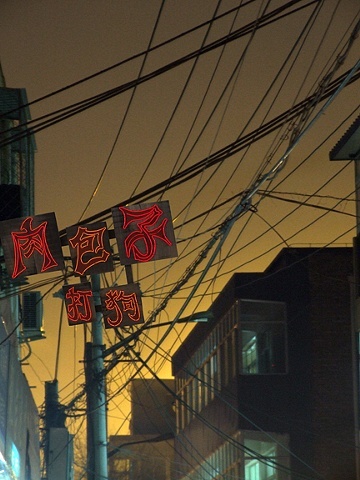 Being in China has opened up narrative possibilities, some particular to the location. The Mr. Wong in the shows title, for example, refers to a Hong Kong fortuneteller to the stars (and political kingpins), a public figure she learned of here, and one that quickly conjures up colorful tales of true and false predictions. Its difficult for anyone not to be fascinated by Chinas rapid growth and economic shift. Snelling describes Chonqing as a crazy mix of skyscrapers, old falling down villages, and new buildings. There is plenty of inspiration in this collision, and she is most specifically drawn to the stuff thats being left in the rubble. She trains her eye on outmoded ramshackle architecture, street markets, coal-burning stoves, massage parlors, all in neighborhoods where a public bathhouse compensates for a lack of indoor plumbing. These places are rapidly being eradicated in the name of progress, even if sometimes the wrecking ball might take with it a colorful, fragrant sense of history. Shes created a sculptural slice of the old Caochangdi Cun village, where the gallery compound and residency is located, as if to preserve the site as she sees it. In the process, she also saves it for the rest of us. Scale is fluid. Her work emulates model train set villages or movie props of towns that might be blown up for a pivotal scene. Viewed through the camera eye you might be convinced that the place actually did get the dynamite treatment. In a gallery, however, we can have direct interaction with objects. Snelling shrinks things down, but also approaches them on their own terms, at life size. Her Caochangdi Cun includes small buildings, along with a full scale, wire-tangled telephone pole and an enterable edifice that contains a cramped room with a cot to rest on and a past its prime TV set. Confining yet cozy, the space alludes to the precarious refuge these old buildings become as neighborhoods change visually and economically. The contrast of the reduced-scale versions echoes the idea by making the architectural elements of the city seem like easily manipulated toys. Snellings work shares this interest in narrative model making with American makers such as Michael McMillen and Michael Ashkin, as well as contemporary Chinese artists Zhou Xiaohu and Chen Shaoxiong, all of whom use a toy-like vernacular (as well as video and photography) to comment upon urban shift. Each of them engage this deceptively playful arena to seduce viewers to ponder more troubling concerns. In Snellings case, one of those is the cultural gap between east and west. With a series of photographs she depicts the glitter and bustle of urban China, along with gritty yet visually textured scenes from the Yangshuo market, which includes stalls selling dog meat. The latter images may appear grisly to pet-owning viewers from the U.S., yet are they really so different than a French Impressionist painting of a butcher shop? Discussing her sense of China, Snelling points to hearty indigenous wit and proverbial inclinations. In a piece composed of blinking neon signs, she uses Chinese characters that roughly translate to English as to hit a dog with a meat-bun. From a Western perspective, its tempting to read this as an allusion to Americas favorite baseball stadium snackthe hot dog. But Snelling is more intrigued by the variety of interpretations attached to the saying, not the least of which is that the dog will not be driven off, but will enjoy the meat bun instead. Which might be to say that the artist has encountered a number of marvelous, unexpected visions during her visits to all the places Mr. Wong sent her.